Bath Bonding is when two or more characters bathe together and have conversation. In Japanese households, it is not unusual for more than one person to occupy the Ofuro at a time and converse. Since the bath is a place where everyone is usually naked, social ranks don't exist in this environment and everyone is considered to be on equal terms. This kind of situation can apply to almost any variation of bathing. Community bathing facilities like Public Baths, Shower Rooms, Onsens and Saunas are designed for this kind of thing. Other ways this is often perceived is through Bathtub Sharing where they are in the same bathtub together or Neighbor Bathing where they are in two different tubs next to each other. "Nadia: The Secret of Blue Water episode 20"
It happens between Nadia la Arwall and Electra. "Nadia: The Secret of Blue Water episode 33"
Nadia la Arwall and Grandis Granva bond while sharing a Bubble Bath together in a Freestanding Bathtub. "Mobile Suit Gundam 0083: Stardust Memory episode 5"
Nina Purpleton and Mora Bascht bond and have conversation together while they are taking Showers in the Shower Room. 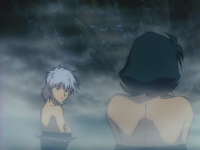 "Mobile Suit Gundam: The 08th MS Team episode 7"
Shiro Amada and Aina Sahalin have a deep conversation during a Mixed Bathing session Skinny Dipping in a custom Hot Spring they made. "Zoids: Chaotic Century episode 8"
Elisi Linette and Moonbay bond together when they share a Shower together. Shinobu and Kaede Shiranui bond together as they have their first Furo session together. Shinobu and Kaede Shiranui bond together as they have a Furo together and do some Back Washing. "Mobile Suit Gundam Seed Destiny episode 24"
Cagalli Yula Athha bonds while bathing in an Uchiyu. Kotona Elegance and Re Mii bond together while they both take a Bath in a Hot Spring. It happens in a Hot Spring between Michiru Kita and Koyomi Yoimachi. Koyomi who is in her alternate personality "Yomi" takes the bonding a little too far and does a Breast Grab to Michiru. Michiru Kita and Koyomi Yoimachi bond while sharing an Undermount Bathtub. This page was last modified on 3 August 2015, at 12:22.